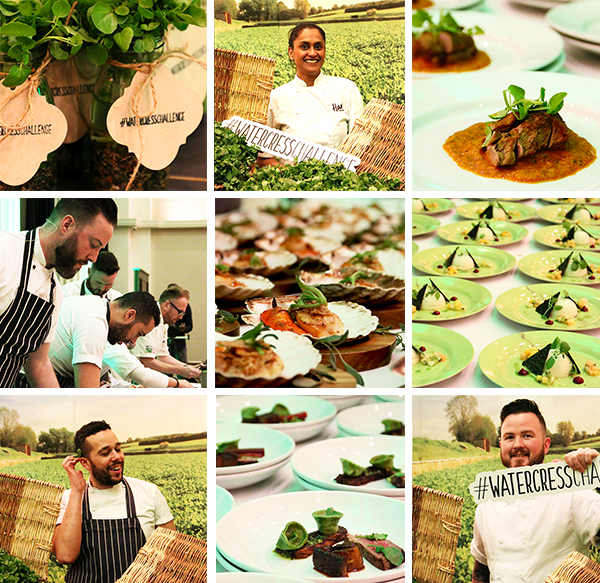 Six leading chefs embraced watercress at a unique event to help growers raise awareness of this nutritious leafy green, with its inclusion in a range of dishes from cocktails to chocolates. We joined forces with London Kitchen Social Live to put on the eight-course dinner at Grace Hall in London at the end of March as part of its marketing campaign #WatercressChallenge, aiming to showcase how wonderfully versatile and delicious watercress is. The interactive event entertained and inspired, with each chef creating an innovative dish featuring the peppery salad vegetable, which were plated up in front of over 60 food enthusiasts. Guests were treated to dishes such as seared scallops with watercress verde and crispy chicken skin from Louisa Ellis and miso glazed potato, black garlic with a watercress veloute from Eddie Kilty. Eddie, a freelance chef and owner of private dining and pop-up business Kilty & Co said “I was asked to take part in the #WatercressChallenge and it was a great privilege to be involved in such a fantastic event to support the farmers and producers with this fantastic ingredient”. From the welcome cocktail and canapés, to the six courses, including the delicious watercress, sweet yoghurt and coconut dome dessert from Chris Wheeler, and even the bespoke chocolates at the end, each dish celebrated the great taste and versatility of watercress. Nicola Dodd, AHDB Marketing Manager said: “I was bowled over by the passion and dedication of the chefs, and the fantastic response from all who attended. People were amazed at how one ingredient can be carried through in so many dishes, and how well watercress paired with so many flavours”. Dishes such as Hari Ghotra’s Tandoori spiced lamb neck fillet on watercress masala, Robbie Lorraine’s 28-day aged fillet of beef with a watercress pesto, and Daniel Britton’s lamb loin, crispy sweetbreads in XO sauce and raw watercress were created using Quality Standard Mark beef and lamb, and received enthusiastic feedback both on the night and since. 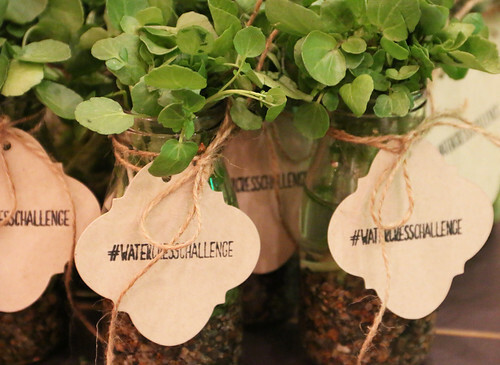 The evening created a lot of buzz on Twitter and Instagram using the #WatercressChallenge, and has inspired chefs, foodservice professionals, influencers and journalists to look at watercress in a new way. The #WatercressChallenge aims to raise awareness of this great nutritious vegetable encouraging people to consider it as more than just a garnish, and to try it in a selection of different dishes from soups and sauces, to salads and smoothies. This was the first time a horticulture marketing campaign led by us and has reached consumers on such a scale, and has proved to be a great success.